E-participation means the use of ICT to broaden and deepen political participation by enabling citizens to connect with one another and with their elected representatives. This is a concept which is much more difficult to implement than it is to understand. With the development of the TID+ project, citizens and officials are handed a tool which is based on seven years of practical experience. 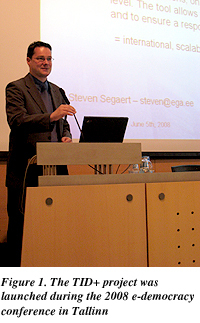 When the European Commission launched a call for projects under its eParticipation Work Programme in 2006, the E-Governance Academy in Tallinn found this to be an ideal opportunity to revive a system which had been in place since June 2001, but which had an uncertain future. A consortium was established with the European University Institute in Florence and with the Estonian State Chancellery. That is a government entity which has had lots of experience with E-participation. It runs the TOM system in Estonia. Now, 18 months later, the resulting TID+ project has been completed, and it is time to take stock of what has been achieved. The TID+ project was inspired by a state-run public participation known as TOM, which is the Estonian acronym for �Today I Decide.� The tool was launched in June 2001, allowing citizens to propose, discuss and vote on new regulations. Its integration in regular government procedures meant that there was an obligation for the government to deliver a motivated response to the entered initiatives that were proposed. The tool has been very successful, with more than 7000 users proposing and discussing 1,187 new initiatives. TOM, however, was not without its problems, because initial enthusiasm for the initiative dropped dramatically over the course of time. The tool is no longer a separate system. 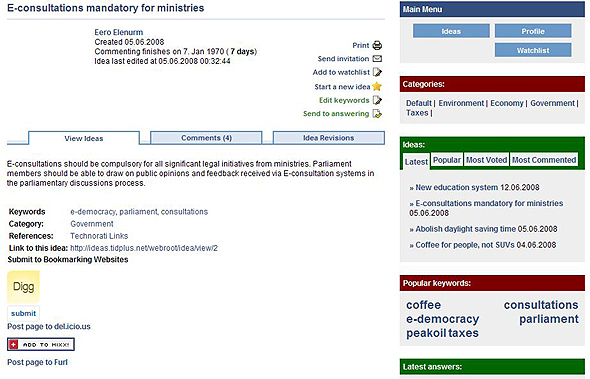 Since June 2008, its functions have been integrated into a new Estonian E-participation portal, Osale.ee. Tom has received international recognition as a �best practice� application, and seven years of experience with this tool have made it clear that it can be a meaningful instrument for any government or public body in the European Union and beyond. Two factors, however, have hampered its potential in terms of awareness and this kind of citizen-driven E-participation outside of Estonia. The first factor is obvious � TOM was essentially a purely Estonian exercise. Not only was the tool available solely in the Estonian language, it also incorporated policy choices and options very relevant for Estonian society, but not necessarily obvious or evident for people in other countries. The second impeding factor was connected to the question of how to unlock the experience gained with the tool. There were lots of statistical data about TOM use, but reasons for increasing or decreasing success were scarcely assessed and understood. The TID+ project ensures that all of this expertise is made available and accessible. First, there is now thorough analysis of how the TOM tool was used and of the different perspectives of citizens and implementing administrations. Second, there is an elaborated software solution which can be readily implemented. Along with it there is documentation which explains not just how the system works, but also why it does what it does. The TID+ project offers two important results � a software solution that is ready for u se, as well as guidelines as to how and why E-participation solutions should be offered. The software offers governments and organisations with a place to start, identifying a functional and elaborate solution which can be offered to citizens so as to channel their ideas vis-à-vis regulations. The tool is straightforward and follows a tried-and-tested procedure which was already visible in the TOM system. 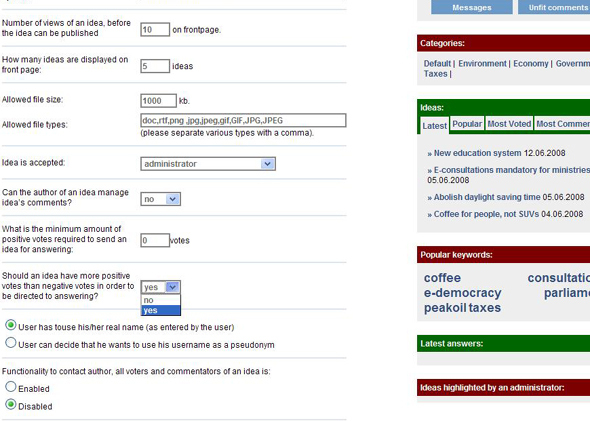 Registered users submit ideas which then pass through a formal discussion phase and then are put to a vote. All registered users can take part. When an idea musters sufficient support, it is forwarded to the relevant authority by the appropriate branch of governmental administration, after which an official response is provided. The TID+ system is more than a pure e-petition system, and different from an e-consultation tool. Ideas originate from citizens themselves, thereby ensuring that the range of proposed topics is set by civil society rather than government. In another crucial departure from standard e-petition systems, commenting and discussion before actual voting are an essential part of the TID+ process. In the improved E-participation process, some choices were specifically inspired by the seven-year experience with the TOM tool in Estonia. Users must present their real names, and any ideas that are submitted need to be accepted by an administrator before they are made public and opened for discussion. This enhances the quality of ideas. These and other options reflect what project organisers have considered to be best practice. Justification for the choices is based on the analysis that has been conducted throughout the project period. The software is not, however, a one-size-fits-all system. Different implementers may make different choices. Some may allow users to use pseudonyms, others might find that the preliminary screening of ideas is unnecessary. The system makes this possible, as an array of options can be changed via an interface, without any need to adapt the software. The value of this lies in the fact that the system can have a different look, feel and user experience without the need for further development. This makes it useable right out of the box in many different settings. TID+ makes Estonia�s experience with E-participation accessible. Seven years of experience are brought together in one easy-to-use tool. Changes to the source code can be made if simple tweaking is not sufficient. The TID+ software is made available under a license which allows for change and redistribution, provided that reference is made to its origin and that the resulting altered system is also made available to others under the same license. Making TID+ free and open source software is a deliberate choice. Project partners hope that if different versions emerge so as to cater to different needs, that will see an increase in the overall uptake of this kind of E-participation, both by citizens and � arguably more crucially � by governments and decision makers. The software, while important, is not enough, of course. Almost always E-governance projects are ones in which the technical aspects are not the most difficult ones. The real challenge lies in formulating what is actually wanted and deciding on how to organise the implement the relevant changes. The same is true with E-participation. The TID+ software makes it possible to seek citizen information and to correlate the resulting information. It does not, however, determine what is to be done with the information. Policy will determine whether citizen ideas are really put to use. Choices have to be made about the system itself, but also � and more importantly � about the flow of information and the follow-up from those who make the system available. For example, the people who can provide answers must be identified, and they must commit themselves to the project prior the system is launched. The TID+ system is more than a pure E-petition system, and different from an E-consultation tool. It offers citizen-driven participation, where people, not governments, set the agenda for discussion. The TID+ project recognises this and offers advice about these issues. There is thorough documentation about the seven years of experience with the TOM tool. It will be useful to bring together the correct partners. Each organisation in the project will have its vision and ideas about E-participation, and that will ensure a multi-angel approach. In Estonia�s case, the E-Governance Academy, as a nongovernmental organisation, provides the voice of the civil society. The State Chancellery of the Republic of Estonia, in turn, adds crucial knowledge about E-democracy from the perspective of the government and administration. The international perspective is brought in via co-operation with the European Union Democracy Observatory � an independent academic organisation which is linked to the European University Institute in Florence. It aims to offer a periodic and ongoing assessment of democratic practices within the EU. Whether or not an E-participation initiative is seen as successful will mostly depend on what people expect from it. The enthusiasm of citizens and administrations fades quickly if the solution is seen as ineffective or unusable. This was clearly seen in interviews with users of the Estonian TOM system. People were disappointed in the fact that government officials often rejected ideas and that there was no visible effect of the posted ideas outside of the system itself. Many users would have welcomed parliamentary or ministerial discussions of the various ideas, and they expected decision makers to pick up the ideas more easily as the basis for further discussion. Another emphasised problem in interviews and discussions was an absence of dialogue between the two sides � citizens as the authors of ideas and government officials as respondents to them. It is equally important that government officials who are called upon to respond to the ideas that are submitted be given the best possible motivation to do so. Questions must be in their specific field of competence, and their quality must be sufficiently higher than that of, say, the general ministry inbox. Many of these problems are addressed in the TID+ project. For instance, administrators can determine the level of support which an idea must receive before it is forwarded for a response. Is it truthful to promise that citizens will have a direct say in the legislative process? If not, then what is promised instead? The answers to these questions will be determined not by the specific software solution which is used to implement E-participation, but rather by what can be summarised as the follow-up which governments can and wish to provide. This can range from a simple notation of suggestions to a real and demonstrable integration of the system into the process of creating and adapting regulations. This, in turn, will depend very much on local traditions and aspirations. The TID+ solution can promote debate on important public issues and provide citizens with a transparent way of channelling their ideas about regulations. As a software application, it does not promise direct democracy in the legislation process. That depends on the position taken by the governments and organisations which use the software. As is the case with any E-participation solution, the level of participation will necessary be limited by what the government desires from it. The important thing is that the government�s commitment and the conditions under which the system is used be made perfectly clear so that the functioning of the system does not turn out to be a disappointment. E-participation is only successful if it meets expectations. The enthusiasm of citizens and administrations alike will fade quickly if the offered solution is seen as ineffective or unusable. TID+ makes Estonia�s experience with E-participation available to others, facilitating new initiatives by offering functional software that is ready for use. The TID+ solution and the relevant knowledge base allow governments and civil society actors to deploy a working system of citizen-driven E-participation with a minimal investment. The programme can be adapted for local needs on the basis of informed choices. Because this ready-to-use E-participation platform is now available, moreover, interested parties can divert the energy that would be needed in the development of their own platform to the all-important policy side of E-participation. The support and commitment of the European Union via the eParticipation Preparatory Action strengthens the hope that the TID+ solution will not remain static at the conclusion of the project. It has many chances to evolve because of prospects for further dissemination, discussion and practical implementation of the project results. This will be aided by the open nature of the software itself. Information about the eParticipation Work Programme is available on the site of the Momentum project, which was conceived to support other projects which are co-financed by the European Union as part of this programme. See http://www.ep-monumentum.eu. All information about the TID+ project and its results can be found at www.tidplus.net.